As we raise our little indoor kitty, Talley, we’re constantly working to make sure she has plenty of opportunities to climb, perch up high, run, play, jump, and have the experiences that are the genetic legacy of the cat. 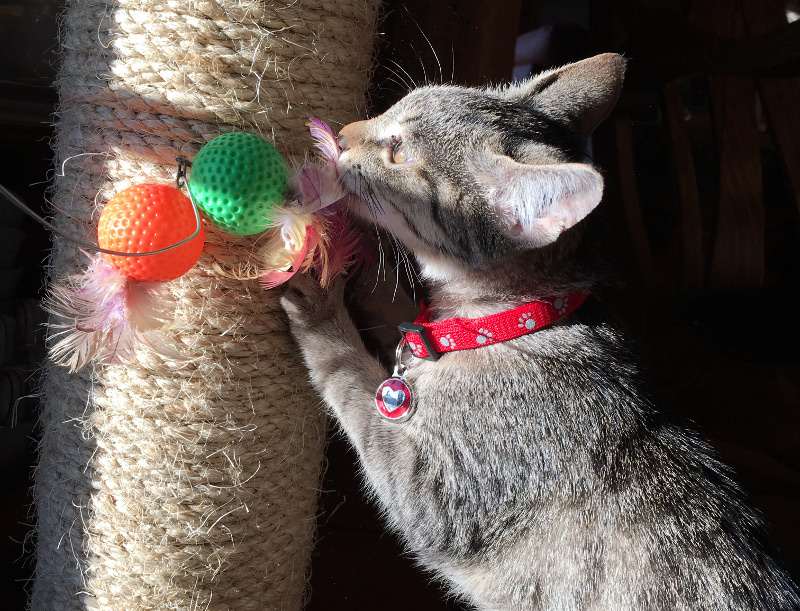 One of our favorite tools is using food puzzles and games to feed her (and all our pets! ), helping create the excitement and mental challenge of the hunting experience. 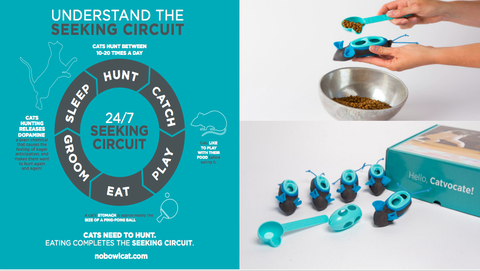 Thanks to veterinarian Dr. Liz Bales, there’s a new food toy that recreates that hunt experience better than any food puzzle or game I’ve ever tried. It’s called the Indoor Hunting Feeder, and it’s from Doc & Phoebe’s. Cats are born hunters. In nature, cats spend 80% of their waking hours hunting for food. Nature made a cat’s stomach the size of a ping-pong ball – the size of a mouse. Cats are programmed to hunt, catch and play with at least 5 small meals a day. Hunting is your cat’s natural, physical and mental exercise. Bowl feeding is overfeeding your cat’s body, while leaving its predatory soul starved. The indoor hunting feeder replicates your cat’s natural feeding behavior. You fill and hide all 5 mice once a day. Now your cat gets to recreate the seeking circuit. Your cat will hunt, catch and play with it’s “prey” before eating an appropriate amount of food at least 5 times a day, just like nature intended. 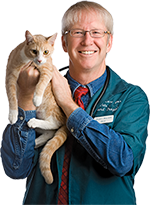 Veterinary science has long known that cats need to hunt for their food for their physical and mental health. Bowl feeding is making our cats bored, stressed and sick. These bowl-created problems are making our cats act out – with scarf and barf, urinating outside of the litter box, aggressive and destructive behavior and even waking us up at night to be fed. As a veterinarian, it makes me sad to see so many bored, under-exercised, over-fed cats — way too many of whom I’d describe as “purring, fur-covered sofa cushions.” On Friday, Feb. 2, 2018, for just 24 hours, you can turn that around by taking advantage of a 20 percent discount on the feeder. You have to be signed up for my Fear Free Happy Homes program (it’s free!) to unlock the deal. Find out more and sign up here — and tell your cat-owning friends and family!